The United States Civil Rights Commission has scheduled a hearing for September 12, 2008, to explore reasons behind the relatively low number of minority scientists in the American workforce. Dr. Richard Sander will be testifying at the hearing about mismatch effects in science on behalf of Project Seaphe. To illustrate the problem, consider the results of a preliminary analysis by Project Seaphe of data from the US Census National Survey of College Graduates. Among some fifteen hundred physical scientists with doctorates in the United States captured by the survey, only eighteen were black and forty-eight Hispanic. Though there are many factors that reduce the number of minorities with college degrees, among college graduates blacks were less than half as likely as whites to have a bachelor’s degree in the physical sciences, and less than one-ninth as likely to have a doctorate in the physical sciences. 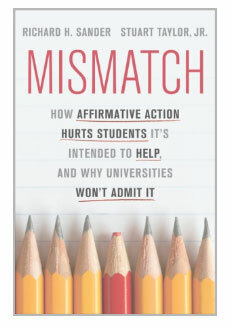 In a 1996 article, several scholars led by Dartmouth psychologist Rogers Elliott argued that mismatch effects played a large role in reducing minority participation in science. Elliott found that as high school seniors, blacks and Hispanics were as likely as whites to report that they planned to pursue a college degree in science. But when minority students receive large preferences, they often find themselves in colleges where the rigor of the curriculum and grading in science courses puts them at a sharp disadvantage, leading them to shift to majors in the humanities and social sciences. Elliott et al suggest that this explains why such a large proportion of the relatively small number of black scientists come from historically black colleges. The Elliott et al analysis did not, however, include a direct test of how a student’s level of mismatch affected their eventual chance of graduating with a science degree. The Shape of the River, which appeared a couple of years after Elliott’s work, did not explicitly discuss this issue (or even cite Elliott), but authors William Bowen and Derek Bok suggested that at elite schools, blacks and whites had substantially identical rates of success in college majors. Project Seaphe is using several databases to explore this debate and use more definitive tests to test the Elliott hypothesis as well as the Bowen & Bok contentions.